These handy tricks and tips prove salt is more than just a seasoning. 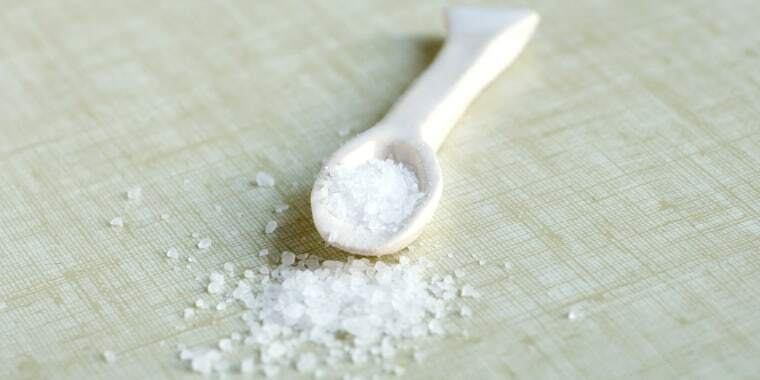 Today, many of us just think of salt as nothing more than a flavor additive, but salt has been a hot commodity throughout many civilizations for thousands of years. That's because they did a lot more with it than sprinkle it on their dinner. Rachel Grant from Bravo’s The Feast dug into some amazing uses of salt for everyday life — from cleaning to making you feel better. According to Grant, who did a lot of research when compiling her list, salt was actually used as currency throughout the Mediterranean in ancient times — it's even where the word “salary” originated. “For centuries, it was even more valuable than gold,” Grant told TODAY Food. In fact, she says there are more than 14,000 uses for salt, but we picked out eight of our favorites from Grant's great video. So dig out that shaker and get ready to put it to use! Who among us hasn’t accidentally tipped over a glass of red wine on carpet? Salt to the rescue! Grant recommends sprinkling salt, ideally with fine granules, over a red wine spill. Leave it on the stain for several hours to absorb the liquid and then vacuum it up. If there’s still some stain left, repeat the process until it’s all gone. Grant said she uses this technique all the time to help flowers stay nice and fresh beyond their usual shelf lives. She adds a teaspoon of salt, which she said works better than sugar, to the water of a vase of flowers to help stave off bacteria and encourage osmosis. A remedy which Grant said she’s used throughout her life is to gurgle with salt water when her throat isn't feeling well. “My father is a doctor, and he always made me wash my mouth and gargle with saltwater. It always has worked a treat,” she said. Of course, the salt won't cure any ailment so it's important to seek medical attention at the onset of an illness but the salt swishing will help you feel better. Another technique she learned from her father was to put just a dash of salt in coffee. “It takes the edge off the bitterness and enhances the flavor,” said Grant. Don't overdo it, or you'll wind up with a cup of undrinkable brown liquid. Adding a paste of salt and water to painful and itchy bug bites can be soothing or, said Grant, you can even hop in a salt bath for maximum treatment. Salt can also help calm poison ivy irritation, but any severe allergic reaction should be examined by a professional. Ever struggle with peeling eggs for deviled eggs? Add a teaspoon of salt to the water before you boil the eggs and the shells will come off much more easily when it's time to peel them. Grant explained that the salt also keeps the shells from breaking while boiling, as well. Love eggs? Check out even more of our favorite egg hacks. Got smelly shoes in the house? Sprinkle a bunch of salt in the shoes and let them sit out for a couple days. The salt will help reduce the bacteria that causes the stink and absorb the moisture. Dump the salt and vacuum out any remaining granules before wearing again. Make a paste of salt and water and rub it directly on perspiration stains. Let the solution soak for a while and then wash clothes as normal. Do not try this hack on a delicate fabric but the stains will be significantly reduced. Time to go stock up on salt! Check out more of Grant's everyday home hacks on Bravo's The Feast.